After throwing the entirety of their last line, DC Icons, out the window, DC Collectibles is attempting to settle in comfortably with their newest all-inclusive line of DC figures, this time dubbed DC Essentials. In my first Essentials review, I made it no secret that I wasn’t 100% on board with the change over, and even after reviewing my first figure, I was still rather skeptical. Well, I’m going to be giving the line a second shot, taking a look at one of the figures DCC keeps trying to get right over and over again, Classic Superman! 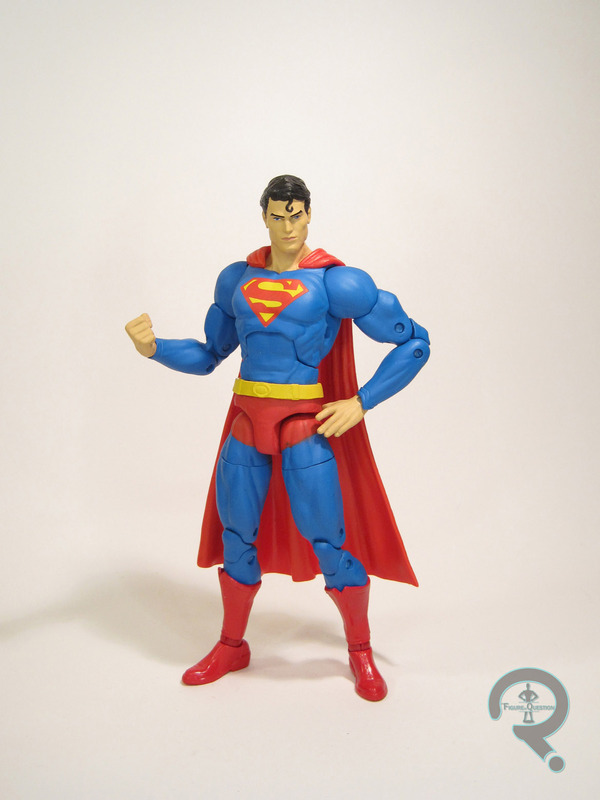 Superman is figure 5 in the DC Essentials line-up, making him numerically the first figure of Series 2 of the line. DCC’s really invested in having these figures pair off, so this guy pairs off with Series 2’s Brainiac figure. 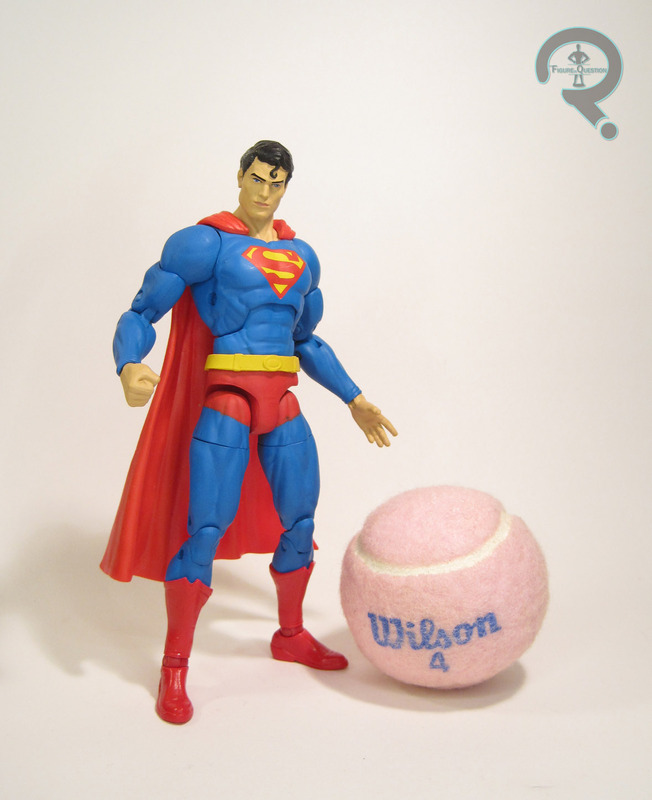 Though he’s a “classic” Superman, this figure is actually based on Supes’ most current appearance, introduced in Action Comics #1000. It’s really the same as his classic garb, but with the teeniest, tiniest little tweek to the edges of his sleeves. Because *something* had to be different. The figure stands 7 inches tall and he has 34 points of articulation. Those numbers aren’t surprising, given they’re the same stats we saw with Reverse Flash. And why is that? Because, except for a small handful of pieces, these are the same figure. There are some issues with that. While using the exact same body worked out fine for the Series 1 line-up of Batman, Flash, Reverse Flash, and Deathstroke, who are all conceivably the same basic build, it doesn’t quite work out for Superman, who I really feel should be a little larger, at least in the upper torso region. It’s still a decent, balanced sculpt, but he sure does look a little bit scrawny (and he still has those overly long arms, which I’m guessing won’t be going away). The shaping of the cape doesn’t really help with that, either, kind of accentuating the small sizing of the upper torso and the comparatively large sizing of the legs. On the plus side, I do rather like the new head sculpt; it feels appropriately Superman-y. Superman’s paint work is okay, but not quite as good as Reverse Flash’s was. Generally, the application is clean, and the colors are nice and bright. However, there’s some rather noticeable slop and unevenness on the edges of the shorts, an issue that plagues all of the Supermen I’ve seen in person. Also, for some reason, the belt is just straight yellow, with no red for the sculpted belt loops, which looks rather strange, and is a very obvious missing paint application. Like Reverse Flash, Superman includes no accessories, which, given the level of re-use and the price-point of these figures is quite frankly insane. At the very least, he should have some extra hands, or a flight stand, or something. Anything at all to make him actually feel worth what you’re paying for him. After buying, and being left uncertain by, Reverse Flash, I really wasn’t sure about this figure. I had initially been very interested, because I’m always on the lookout for a really good classic Superman. When this guy showed up at Cosmic Comix, I initially passed on him, and ended up waiting to take advantage of their “Biggest Sale of the Year!” a couple of weeks ago. At a lowered price, this figure feels justified, but still somewhat far from the mark. He’s an okay standard Superman, but with the larger scale and all, I still find myself preferring NECA’s Christopher Reeve Superman as my go-to. Were he in-scale with Legends, it might be a different story, but this is the path DCC’s chosen to go down, and this is the hill they want to die on. And dying on the hill sadly seems to be what’s destined for DC Essentials, because they just don’t seem to be gaining the foothold they were hoping for. Apart from the upcoming Green Lantern (who I’m going to be getting purely because I have trouble saying no to even a semi-decent GL figure), I just really can’t see myself supporting this line.